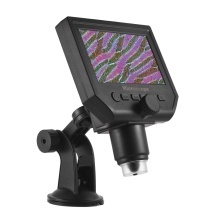 This digital video microscope, with 4.3 inches HD LCD display and 600X magnification , is best for kids, students, engineers, inventors, and others who need to magnify and explore the micro things. This will also be a funny experience. Take it and be a funny and careful observer! High brightness 8 LEDs, available for working up to 100 thousand hours, with 4.3 inch HD display for easily observing more details. Support auto power off function for power saving; Support inserting memory card to take photos and video for network sharing and computer saving. USB interface for charging easily (including USB cable and power adapter), built-in lithium battery can work continuously for 6 hours after fully charged. The stand, with 2 adjustable knobs and reusable sucker disk, is very stable and practical, and you can adjust the angle as your requirements while you do not have to worry about the shaking. Supported language: English, Spanish, Russian, Korean, Japanese, Thai, Hebrew, Portuguese, German, French, Italy, Turkey, Czech, Poland, Traditional Chinese, simplified Chinese. Widely used in mobile phone maintenance, QC inspection, education purpose inspection, industrial inspection, print industrial, jewelry collections, textile industrial and biological inspection.